Back when 2006 turned to 2007 I got a set of wheels built on the original Velocity Blunt rims. At the time, they were some of the widest, (at 28mm) and competitively light weight rims for 29″ers available. Like many rims for 700c mountain bike tires, the fit was not very good. That was par for the course then. Now things are radically different, and seeing that, Velocity set out to update the Blunt slightly . Early this year rims started showing up that reflected the change to get tires to fit a bit better than they did on the original Blunts. The rest of the design, with exception to the more subdued graphics, remains largely unchanged. I again obtained a set of pre-built Blunts on XT hubs and have been riding them for the past couple of months now. Here is my update on the Blunt rims. As you can see, I went for a subtle color. (ha!) Velocity Blunts now come in a myriad of anodized and powder coated colors. The graphics are much better, (my opinion) and I don’t have to feel like a rolling billboard while using these. Okay, so much for the looks. That is fine, but how do these stack up against the advancements since early 2007? 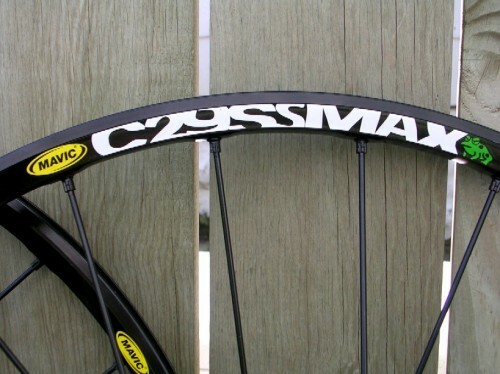 My feeling is that in 2009 going forward, if you have a rim design, it had better have some sort of rim strip design that can be employed to make it tubeless, or be a tubeless rim, and have the manufacturer’s blessing upon said system. 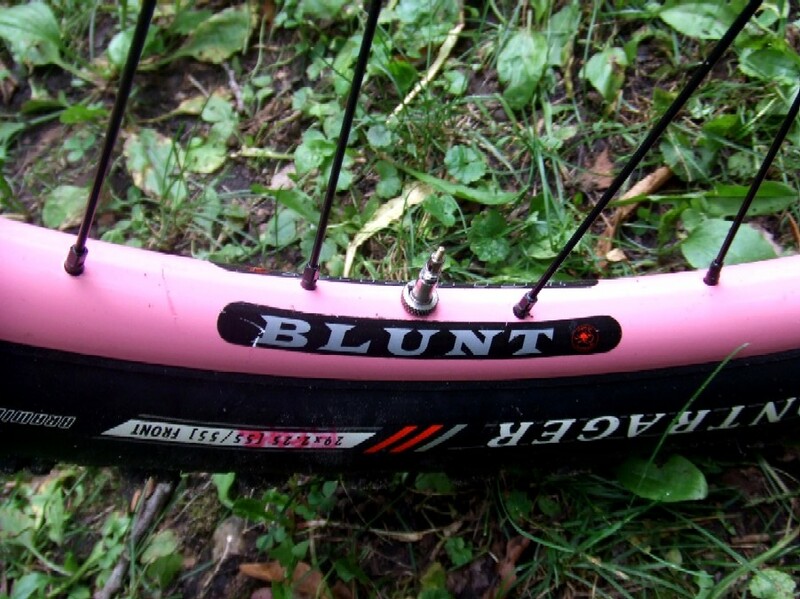 Now, Velocity designed this rim in 2006, so I can understand the Blunt not being tubeless, but a tubeless design/system of some sort needs to be developed by Velocity, or their rim designs will become antiquated in a hurry. 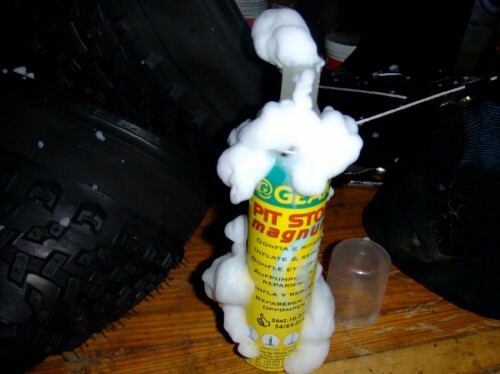 That said, I discovered a way to make the Blunt tubeless for me that worked and seems reliable for me. I am not recommending this as a solution, nor does Velocity recommend this. So, if you do this, it is at your own risk. I used a plastic Rhythm rim strip from Bontrager which fit rather well in the Blunts. The tires here are Bontrager TLR XR models. No issues at all with the set up, for me. I wish rim companies would take the initiative to develop or recommend certain solutions for tubeless use, but in the meantime, we are left to our own devices. Again, this worked for me, your mileage may vary. Hopefully the new Velocity rim design that is currently in development will be part of a tubeless ready system. The set up has been problem free so far with the Blackbuck having been switched over to a rigid fork since this image was taken of it back in July. The rims are still true and round. The width gives the XR tires a great footprint on the earth and I really think the XR’s have come to life because of it and the tubeless set up. I have bottomed out a couple of times but no damage to the rims so far. Rigidity is harder to gauge due to the fact that I did not personally build the wheels, but knowing Velocity rims as I do, I would say that they are on par for the course in this regard. Did the tires fit better? While I never tried the tires with a traditional tube set up, I would say that the fit still isn’t all that tight when compared to say, the Salsa Semi/Gordo rims, which I would hold as a benchmark for tubed tire fit. Conclusions: My take on the Blunt rims is that they are a great training/XC type of product that will work for average trail riders looking for something different in looks and color options. If you are abusive, aggressive, or a really big fella, these may not be for you. 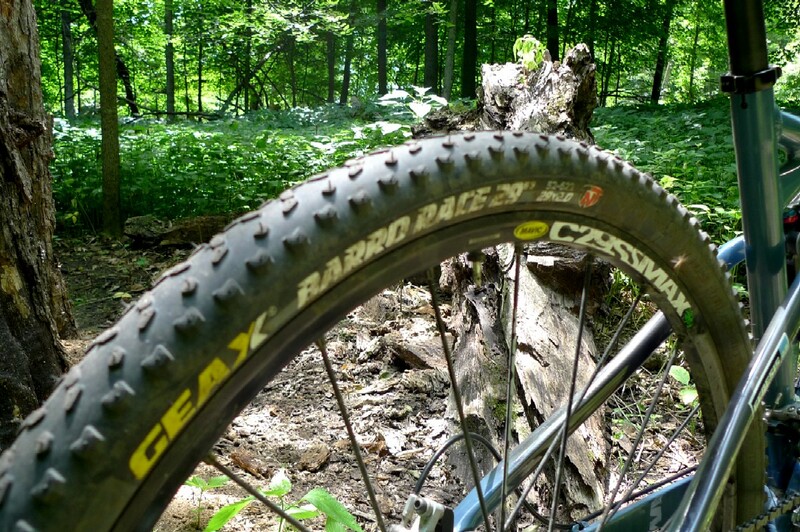 Unfortunately the Blunt came out at a time when factory tubeless ready tires were still a bit of a pipe dream for 29″ers, and because of this, there is no real recommended way to make them tubeless. Enterprising tubeless devotees have done it, but keep in mind that you assume responsibility for your actions regarding the conversion of a Blunt to tubelessness. Velocity Blunt rims are available through several sources and on-line as pre-built wheels from several sources in a wide array of color combinations. Editor’s Note: This time you all get two reviews for the price of one. Grannygear and Guitar Ted tag team on the final review of the Continental Race King tires. 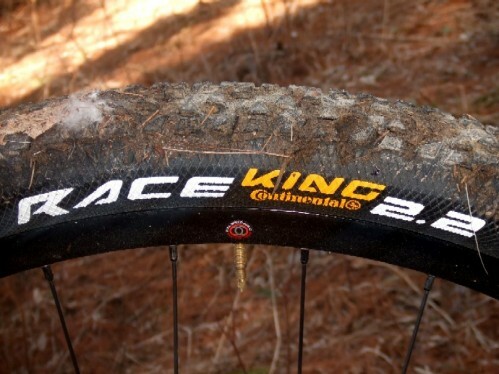 The race tire reviews keep coming and this one is going to be my final look at the Continental Race King 2.2″er tire that debuted this year. Take a look at my previous posts on the Race King here, here, and a comparison with two other racing oriented tires here. First, the lack of anything substantial for side knobs means that lateral traction is not good. If these tires let go, you won’t save it in a corner. Ruts, off camber, or loose rocks and wet roots reveal this weakness as well. Secondly, any “extreme” situation will quickly overwhelm the Race King. Loose rocks, steep pitches, mud, or loose over hardpack will make you wish for more aggressive tread. At any rate, the tires were good up until the point that you were stuffing them into corners and if there was any sort of wetness, looseness, or rubble, the front tire would be overwhelmed and the bike would wash out. Also, the technical, rocky, and off camber terrain was another place that seemed to be tough on the Race Kings. Not much grip there and similar problems would crop up with the front tire especially. 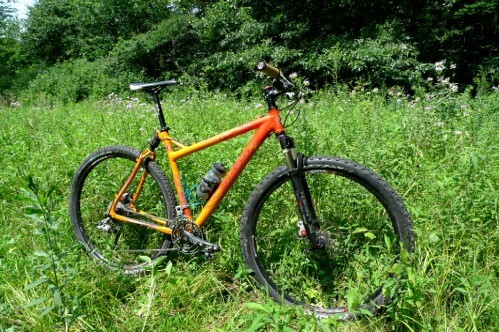 That said, the Race King is great if the trails are tacky, dry, and buff. You can really rail these on twisty single track that is suited to them. I found climbing traction to be consistently good unless the trails got wet. Wear was good and I didn’t see any degradation of the tread blocks even though some of my multi-terrain rides consisted of lots of pavement riding while these tires were on my Salsa Cycles Fargo. Hard pack was fast with little rolling resistance felt. The issues I had initially with the width were rectified with time and a switch to tubeless. The claimed width was exceeded, and much like the Mountain Kings, Continental seems to have “stretch” built into their tires these days. That said, the fact that these Race Kings made it over 2.2 inches in width is astonishing based on their paltry, out of the box width at the beginning of the test period. Conclusions: The Race King, (and the Mountain King, for that matter), should not be judged on width out of the box, and those smallish knobs sure do more than you think they will. If the surface you run on gets wet consistently, is very technical, or suffers from loose rocks or “kitty litter”, you might want to use a different front tire with better cornering capabilities than the Race King has. It has a decent weight, sets up tubeless very well, and has a longer lasting tread compound than other race tires I have tested so far with maybe the exception of WTB’s Vulpine. Overall it is an excellent racing tread that can be ridden as an everyday tire, a “to the trail” tire, and holds its own on anything dry and tacky. It has a great use of its volume, and is recommended for rigid riders. It isn’t perfect, but Continental has another great tire now for 29″er freaks that will “go fast” with the best of them. And now, our contributor Grannygear, has his take on Conti’s newest 29″er tread. West Coast Wrap-up – I have been riding the whoopee out of these Conti Race King 2.2s for a couple of months now and I think I have enough time on them to make some final statements. I have had them mounted on the Leviathan FS on Stan’s Flow rims set up tubeless and on the SS on DT Swiss 7.1TK rims running tubes. I received these tires at the beginning of summer so dry and loose has been the word. I will not see mud for months and months so although I did get these tires into some wet conditions, I have no real data on the Race Kings in sloppy conditions. They mounted up fairly easily on the Flows and inflated with a floor pump and a bit more sweat and frantic motion then the Specialized 2-Bliss tires required. Filled with Stan’s goop, they have shown very little leakage and have held air nicely. I have run them at 25 lbs on both sets of wheels but I did run them as low as 18 lbs on the Flows (briefly…by mistake) and I had no issues. They are a very tall tire and actually, when mounted on the Flows sans tubes, they are quite plump with a casing that is wider than the tread. On the narrower DT Swiss rims with tubes they cut a much narrower profile. In fact, the difference in performance between the two sets of wheels when using the Race Kings was fairly dramatic when it came to loose and/or sandy conditions. -They are a fast rolling tire. You would expect that by looking at them and they do not disappoint. There is very little noise on pavement. -I found the rounder, even knobbied profile to be the cat’s pajamas as far as providing a smooth and predictable transition from straight up to banked over in a turn. They seem to have no mind of their own like some more aggressive tires, especially ones that have a very pronounced outer row of knobs. However, if your style is more tuned to the ‘run right into the corner and then toss it over hard’ kind of cornering, then these may be a bit less than you would like. -On any hard surface they are fabulous. From pine needled loam over clay to kitty litter over hardpack, they have been excellent performers. If they do break loose, I never felt like they were trying to escape and it was very controllable. -I really appreciated the lively feel and tall profile over rocky sections. -I found them to climb well and on the SS, I had some issues with breaking loose with out of the saddle efforts on sand over hardpack, but here they did outperform the Specialized FastTraks which are a comparable tire in size and intent. -They seem to be wearing well. The front tire still has the mold ‘feathers’ in the center of the tire. -I found the braking performance to be quite acceptable. -If you are in very loose or sandy terrain, these may not be the deal. That bigger casing and the tiny knobs do better than you might think in sand, especially when on the wider Flows, but they do cut in to the surface pretty quickly, leaving you searching for the right line. As well, the lack of side knobs can be pretty sketchy when you need to climb out of a rut. It is no freeride tire and I think that Florida may not be the best place for these tires either. 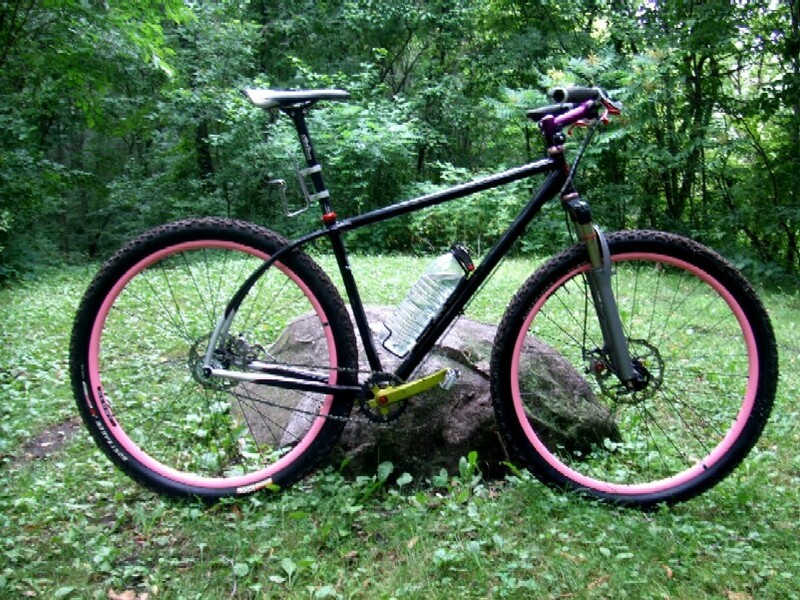 I found them to be acceptable for the Lev with the fuller profile the rims allowed for, but on the SS, I actually was annoyed enough to swap the front to a slightly used Mtn King 2.4 and kept the Race King as a rear. That is actually a fabulous combo IMO as the Mtn King is much more adept in loose soil. -If you do brake past the limits of traction for the rear tire, it will get up on top of the dirt and slide rather quickly, but also quite controllably. In fact, although I try not to ride that way due to trail damage, they are a blast to brakeslide around corners as they don’t seem to do anything sudden and drastic when playing Johnny Tomac in the corners. -Ahhhh…..actually, I cannot think of anything else I did not like about the tires. I never got them into enough mud to know, but I doubt they would be all that great. The wrap-up this past weekend was a 45 mile, 8 hour endurance ride in the Utah backcountry. I took the Lev with the tubeless Race Kings and expected to be riding in sandy and challenging conditions that should point to another tire. But the rest of the ride was over hard packed and buff roads and trails and I wanted the faster and sure-footed tire for that. What to do? I took a gamble and ran ’em as they were and I have to say that they outperformed my expectations. Where I could not continue to ride due to sinking into the sand, no one else was riding either. They actually will carve in sand like a ski, so as they cut into the sand and begin to sink, if you can keep the gas applied, I found them to hold a line and not stop forward motion. It was spooky sometimes if I was moving fast, but it was pretty fun too. On the hard pack and buff trails of Thunder Mountain they simply ruled. I like ’em as a hard conditions tire with a broader range than you might expect. They do not hit the high mark as an all arounder like the Specialized Captain Controls do, but they are pretty close. Continental now has two of my favorite tires; the Mtn King 2.4 and the new Race King 2.2. The Geax Barro Race 29″er tires come in three versions. What we have here is the final word on the “TNT” version, which essentially is a tubeless ready tire with a UST bead interface. For previous posts on the Barro Race, check out these posts: #1, #2 , #3, and this comparison post. The Barro Race tires were mounted up tubeless to Mavic Cr29ssmax wheels and were run on a fully rigid bike and the Fisher HiFi pictured above. Trail conditions for the latter part of the test period dried out nicely and were ideal to check out this race oriented shoe. The pressures were kept on the lower side of the 20’s since the Geax TNT casing tends to be a stiffer casing than most tires out there. Rolling Resistance- Knobby Vibrations: The one constant with the Geax Barro Race is the feeling on smoother sections you get from the knobs. They vibrate the bike in such a way that you feel it in the seat of the pants and on the grips. It is subtle to be sure, but odd as well, since the Barro Race has such low knobs. Again, I attribute this to the stiffer TNT casing. Once in the rough stuff, the sensation is gone, of course. Is it higher rolling resistance? I couldn’t tell by my times, but that sensation is there. I suppose I should mention here that the Barro Race showed significant wear to the point that the first millimeter of tread height in the middle of the tire had worn off during the test period. Of all the tires we are testing here this year, the Barro Race appears to be the fastest wearing one. It is a race tire after all! Climbing: Climbing traction is very good with the Barro Race tires, but it is also very pressure sensitive. Lower pressures will reveal better climbing performance. Probably significantly lower than you would run with other tires in the class of this one. The Barro Race was very good in this way on the full suspension rig. Braking Performance: Given the narrowness of this tire and the lack of volume, I would rate it as excellent in braking performance for this class of tire. I could break it loose if I wanted to, but it was very predictable in how it would react to braking. Cornering Performance: The Barro Race tires do well at cornering with the excellent edge knobs it has. For a race tire, it may well be one of the best in that regard. Of course, as I have stated, it is narrow and doesn’t have a ton of volume, and with its stiffer TNT casing, you can get your pressure too high and the tire will be miserable. Play with the pressures to find the sweet spot and you will be rewarded with much better results. I found it also worked best if you use a more aggressive lean angle, as it doesn’t have much for transitional cornering knobs. The Geax TNT construction gives the Barro Race a great platform for tubeless use, although it may be a tough fit on some Stan’s rims and will be nigh unto impossible to mount on a Bontrager rim with a TLR plastic rim strip installed. This tire will work swimmingly with the UST type rims on Mavic, Fulcrum, and Shimano offerings though. Conclusions: The Geax Barro Race tires are excellent cornering and climbing tires with the caveat that you have to use the correct pressures, (read “lower”) and really lean the bike over in the corner. The TNT casing promises lower probability of getting torn up by rocks or thorns and rolls pretty well even though it may feel like it is robbing you of momentum in smoother, hard packed sections. Choose your tubeless system wisely, and the Barro Race will perform excellently in that state. This tire should be on your radar if you are looking for a sturdy, fast, trail worthy racing tire. Just keep in mind that it is indeed a racing tire, and the softer rubber compound will wear accordingly. For the right rider, this tire is an excellent choice. I have had the pleasure of rolling these Bontrager treads now for several months. Here are my final thoughts on the combination. If you want to get into more detail on some of the aspects of the tires, you can check out my previous posts here, here, and a comparison post here. Taking my initial impressions into account, let’s see if the observations I had at first held true. The trails were mostly dry during this period and moisture wasn’t an issue. Some dry over hard pack and sand was present along with rocks and roots. Rolling Resistance: The rolling factor was good. I never felt that the 29-3 was a hindrance in this area. In fact, I am betting the production tires are even better in this regard, since my casings were pre-production, and were stiffer and heavier. Even the front, with its deeper, bigger knobs rolled quite nicely. Climbing: This is still an amazing feature of the rear tire. It hooks up really well and the drier the better. It doesn’t like loose, or rocky stuff real well though. Technical climbs may break the rear loose, but over all, the 29-3 rear scores highly on climbing. Cornering: The 29-3 front tire really is a great cornering tire. Lateral support is excellent, and you really have to overcook the corner to make it break loose. The front fairs better in loose over hard than the rear, and doesn’t need to be leaned way over to work. The squarish profile has a lot to do with this. Cornering for the rear tire isn’t as solid, with the rear wanting to break free and slide far before the front will. The smaller volume casing also trends the tire in that direction as well. Braking: The front is great in braking traction, but you will break the rear free very easily. This could be a problem on very technical courses for some folks. The 29-3 front is a great all round tire and would probably mimic the WTB Prowler on the rear, which is a solid all round tire. Running a bit taller and squarer casing, the 29-3 front specific tire should lend plenty of mud clearance and be great on a rigid bike. 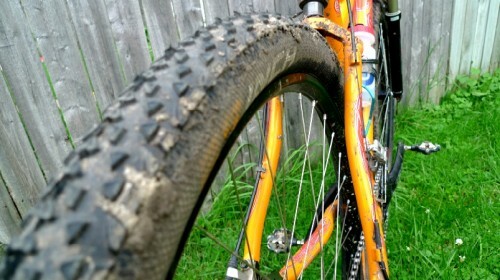 As a front tire it is a very good choice, especially if you want a fast, grippy tire that rails corners. The 29-3 rear tire is surprisingly good as a climbing tire and overachieves in most situations as a rear. Racers are using this as a front to match it on the rear with great success. That said, this is a finesse tire that will reward a skilled, patient rider. Those that are more aggressive and care free in style will over tax this tire quickly. It rolls very well, and the size may make this a great choice for a “monster cross” application. Overall Wear: These tires are pre-production, but I have noticed some significant wear, especially on the rear tire, during the course of the test. This is a racing tire, so expectations for pavement wear should be less. Conclusions: Hands down, this is one of- if not the most- odd combinations of tires for front and rear ever made for a mountain bike. Still, as a team the tires work well. Tubeless they had the same bomber reliability that the TLR system is known for. I would like to see Bontrager up the width on the rear to “true” 2 inch width to better balance with the excellent front tire. As it is, the combination is not quite what it could be. I would highly recommend the front tire, and the rear is an excellent racing tread for skilled riders that can finesse the performance out of this tire without overwhelming it. Make that rear tire a bit wider,add volume, and we would really have a great set up for all around race conditions here. Here in my final installment on tubeless mountain bike technology and specifically tubeless tire technology for 29 inch wheels, I want to address some areas of concern and where I think the tubeless tire and wheel products of the future can help to make big wheel mountain biking even better. While Giant made the new XTC-1 29″er rims tubeless compatible with a Stan’s rim strip, the tires mounted stock are not rated for tubeless use. Why Not Go Tubeless From The Start? : The modern mountain bike rider is pretty information savvy. Tubeless benefits and performance are pretty well known and accepted by more and more mountain bikers everyday. To my mind it makes absolutely no sense to not have your product be ready to go tubeless out of the gate these days. Why not enhance the value and appeal of your wheels and tires by offering this as an option? Yes, tubes should be supported, and I still use tubes in many applications today, but if you are a serious mountain biker, you probably will be more tempted to buy a product that supports tubeless use than one that doesn’t. I certainly can also see why manufacturers won’t be too thrilled with doing this. The technology to develop your own system, or get UST certification is expensive and time consuming. 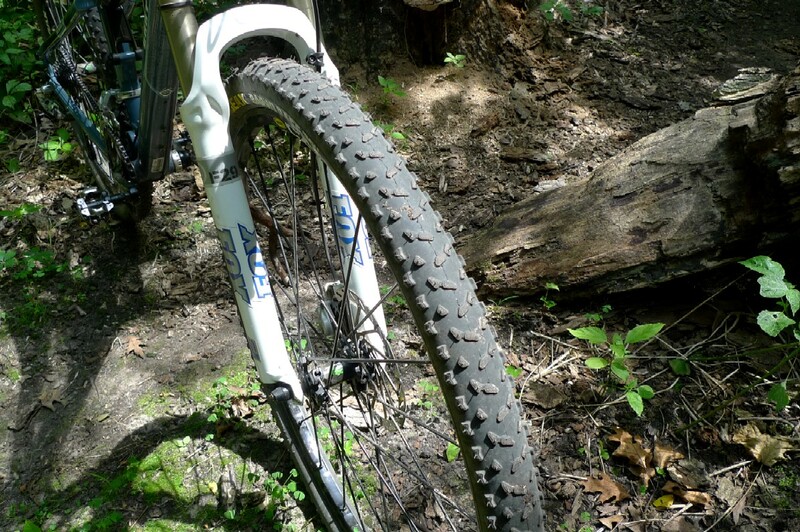 That said, a non-tubeless rim or tire is quickly being viewed as being “off the back” by mountain bikers. 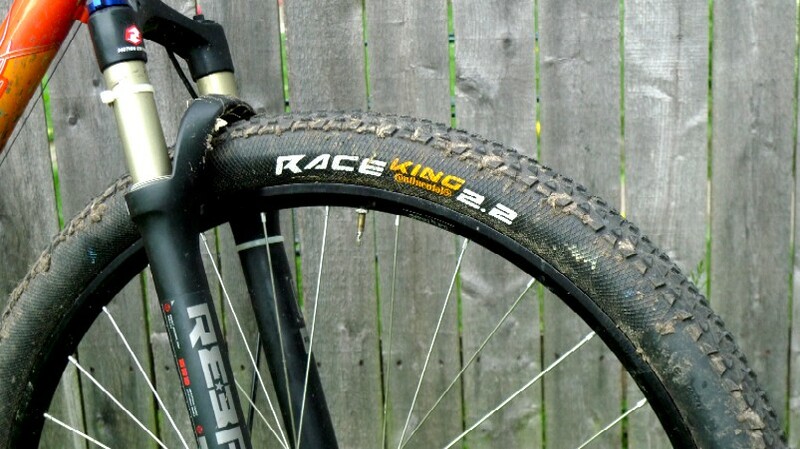 I agree that tubeless tires and rims that are reliable, easy to use and live with, and reasonably priced are the future of 29″er tires and rims. Information Please: While this series of articles is hopefully shining a little light on this subject, it is by no means an exhaustive study of all products on the market and which are compatible with each other. Getting everybody on the same page might be asking too much, but would it be unthinkable for a rim manufacturer, lets say, to recommend tires for use as tubeless on their product? (Stan’s does this already). Or how about a tire manufacturer giving us some idea of how their product works tubeless on other tubeless designed rims? The conversation is pretty one sided on this score and the user group is the only one making any real noise here. I think that is a shame. The UST standard should be either opened to all manufacturers, or another system equivalent to it, so as it is with BB30 bottom brackets, users can all be assured that “this” tire can go on “that” rim without being a living, riding guinea pig. Oh yeah, and let’s not forget about sealants in this conversation either. The Bottom Line: In the end, how ever things shake out, we as mountain bikers ask only a few things: That the tires be reliable, the rim/tire interface be safe, and that the tires, sealants, and rims be compatible with each other and easy to use. If this starts to become a reality, the days of tubeless tires and rims for 29″ers will finally become like that of the 26 inch world. One of the readers of Twenty Nine Inches- “Mickey”, had some great questions that were posted in the comment section of the last article. I thought I would break them out into their own post and share the answers with all of you readers. 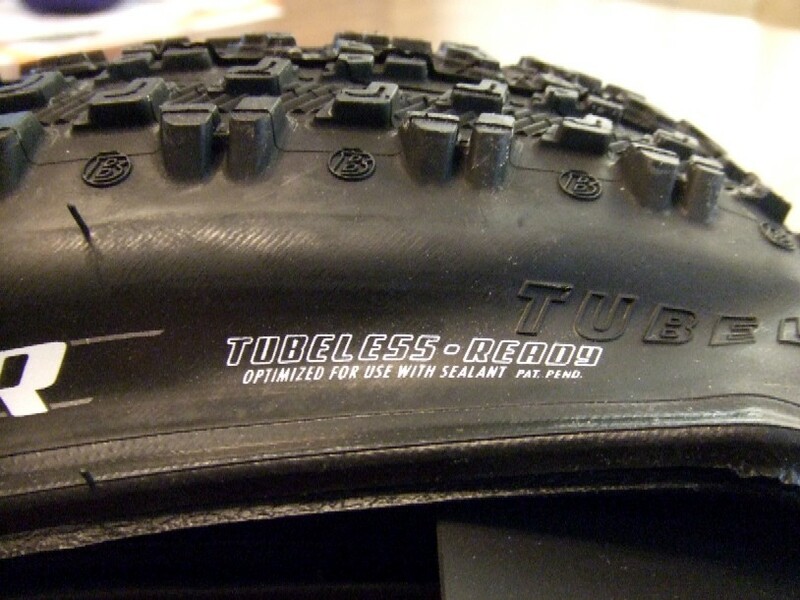 Here are some day to day issues one might face going tubeless. What (do) you do with (old) sealant then, throw it away? Probably yes, but how? : This question can be answered in a few ways depending upon which sealant you are using. If you are using a latex based sealant and it dries up, there really isn’t any clean up necessary. Usually the sealant dries into “interesting formations” which Stan’s users have a rather uncouth name for. (!!) These can simply be discarded. If the sealant isn’t dried out though, it can be re-used. 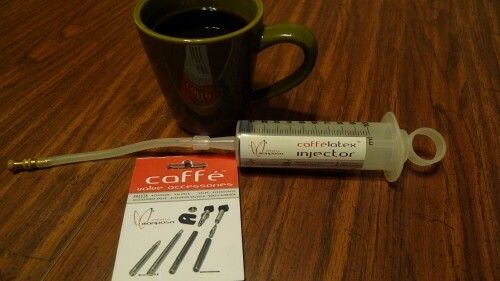 Recovery of old sealant from a tire usually is easiest when using a “syringe” type instrument such as the unit available from Stan’s or a similar product from CaffeLatex. Draw out the old sealant and mix it in with new sealant, then add it back into a new tire. An injector/syringe tool aids in sealant recovery as well as injecting sealant into tubeless tires. Glycol based sealants are usually still wet after several months, but may be dried up to a thicker, gooey consistency. If you are switching out tires, it generally will be easier to wipe up the old sealant with an old rag or sponge. After getting the majority of the sealant out, you can wash with a soapy water solution and rinse with water to get any left over residue out. Your rag or sponge could be washed, or discarded with other hazardous waste. How do you clean tires inside when changing to another (pair)? : Again, in a similar way to what I describe above. Just remember to discard the old rags or sponge with your other hazardous waste. 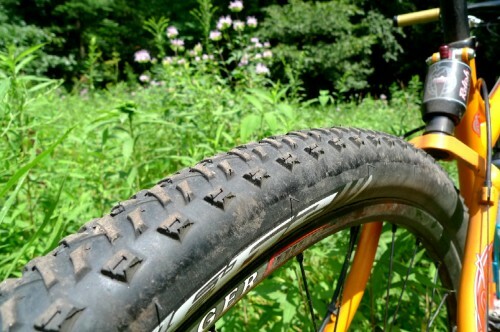 How do you put the tube (in) when the puncture is too big and you are on the (trail) ? Once you have determined the sealant isn’t going to seal the puncture, you should release all the air in the tire, break down the beads from the rim, and remove the tubeless valve stem. All rather simple things to do, but the whole process is complicated by the mess of sealant you will encounter within your tubeless tire. I have experienced this a couple of times. 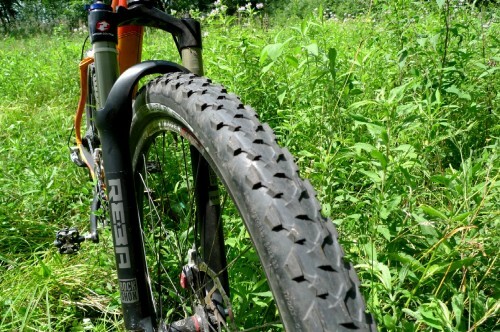 My advice is to carefully install a slightly inflated tube and push the bead of the tire over the rim without removing the sealant out on the trail. (Of course, making sure you do not have a foreign object in the tire yet, or a tear that requires a tire boot.) Keeping sealant off the trail and off you is the best way, if at all possible. How (do) all those sealants work during a winter time? Sealants that are water/latex solutions will freeze up. Sealants that are glycol based are much less likely to freeze up, but may become too thick to really seal any punctures depending upon how cold it is out and the particular sealant in question. Some home brew sealants use windshield washer solvent, which aids in keeping the solution from freezing. In my experience, tubeless tires will still work in winter, but you may not see the puncture protection benefits that you do in summer, or during warmer weather. Okay, that’s a wrap on Mickey’s questions. Thanks Mickey for writing those in the comments section. Remember, if you have any questions, just put them in the comments. I try to answer all of them and I may use one of yours in a future post. After getting to know why you would want to go tubeless, we now will delve into the “how” of going tubeless with your “wagon wheels”. There are a couple of standardized systems out which I will cover first. Then I will touch briefly on the typical ways folks are turning components meant to be used with tubes into their own tubeless systems. But before that, we need to understand a couple of key things that must be done by any company or individual that attempts to attain a state of perfect “tubelessness”. Without making sure these things are secured, disaster, possible injury, and even death may result. Really! First, a way to seal the rim well must be found, and usually this means sealing off a bunch of spoke holes drilled into the rim. Of course, if you can find a way around drilling all those holes, it makes this job a lot easier, and in fact, that is why a UST standard rim is so appealing. Unfortunately, only pre-built wheel sets are available with this sort of rim, so unless you buy into a complete system, the UST rim isn’t an option. Other ways to seal a traditionally drilled rim have been done, and usually in conjunction with a specific rim extrusion. Bontrager TLR rim strip, tubeless valve stems, and bonus skewer image! Stan’s NoTube system consists of a specially extruded rim that features a “bead socket” for the tire and a rim well designed to assist in making a tubeless tire air up without much effort. The spoke holes are covered with a specially developed rim tape, thus sealing off the holes in an effective manner. Bontrager does something similar with its Tubeless Ready System, but instead of a tape, they developed a rim well and plastic strip that mate together. 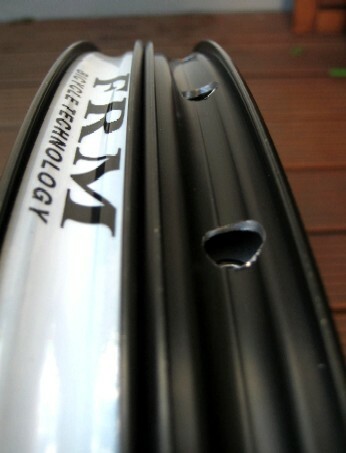 The rim can be built on any hub, then the plastic rim strip is snapped into place, sealing off the spoke drilling. In fact, a tubeless tire set up on this system actually seals against the strip, and not the rim. Now you’re almost there. You will need a special tubeless valve stem to finish off the job. Bontrager, Stan’s, Mavic, and others make these, and home made ones will also work. The valve- usually a Presta, but not always- is made to have an inner seal of some sort. Either an “o” ring seal or a rubber type collar around the valve on the inside is employed with a nut that threads on to the outside which pulls the inner seal against the rim strip, sealing off the valve hole in the rim. 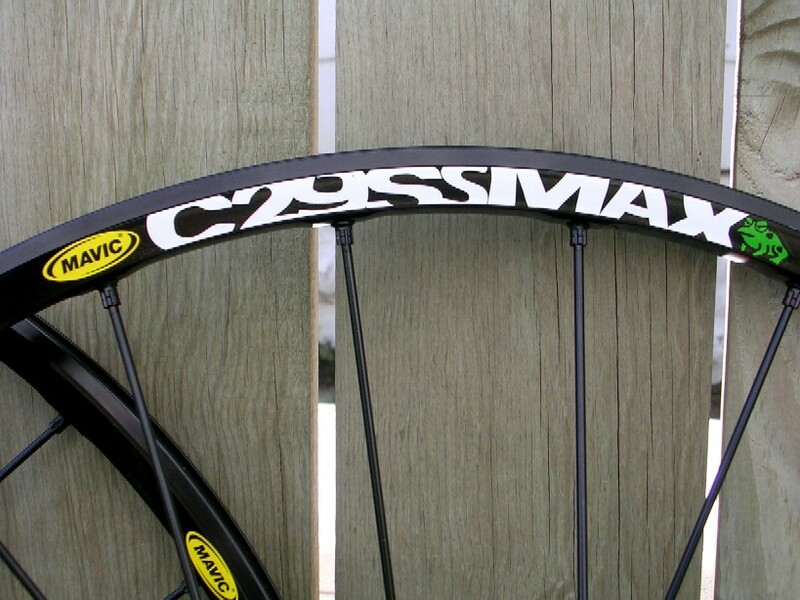 Mavic’s Cr29ssmaxx were the first UST rims available for 29″ers. Okay, now the final piece of the puzzle is the tire. A typical folding bead tire isn’t made to keep air inside its carcass- that is the job of the inner tube. So tire manufacturers either do one of two things- they make a true, air tight casing and bead, or they make an airtight bead with a casing that requires sealant to become air tight. A standard developed by Mavic and other tire manufacturers called “UST” is one way this can be done, but most manufacturers have eschewed this avenue for their own systems which all are of the “tubeless ready” type requiring sealant to become air tight. The common denominator of all of these though is a tighter rim bead diameter standard and special bead construction. Without holding the rim bead dimensions to tight tolerances and reinforcing this critical area of the tire, blow offs and other failures would result and cause possibly catastrophic results for riders. Special beads are part of a tubeless ready tire and make them safe to use tubeless. Sealant is the last bit needed before most systems will operate safely and effectively. Usually some sort of latex based sealant is introduced into the tire carcass which seals off the carcasses porous inner walls making it air tight without using an extra layer of rubber as UST tires do. This results in a lighter, more supple casing, and a heightened level of performance in most cases. Sealants come in many forms, some being glycol based, and even home brews are popular with many riders. Most sealants are latex based such as this Geax product. Many riders have been doing their own conversions of standard tubed wheels and tires using home made sealants and rim strips for years. Most of these systems use some sort of combination of reinforced packing tape, a foam backed tape of some sort to fill in deeper rim wells, and home made valve stems. Some folks use split open tubes as rim strips as well. Sealants based on mixtures of commercially available sealants, or mold building latex mixed with an ammonia based substance like windshield washer solvents are common. The tires used are typical tubed tires resulting in various levels of success ranging from bulletproof reliability to hit and miss successes resulting in occasional failures, crashes, and injuries. Mixed Systems: Some riders will try “mixing and matching” systems or components with each other, and may even do this while introducing their own “home brew” solutions as sealants. Generally I have found that some things work, and some things don’t. 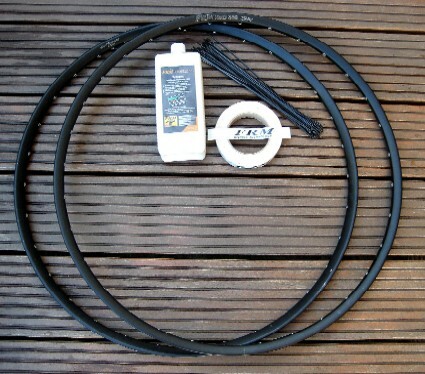 Here is a short list of my personal findings in messing around with tubeless systems. Your results may vary. 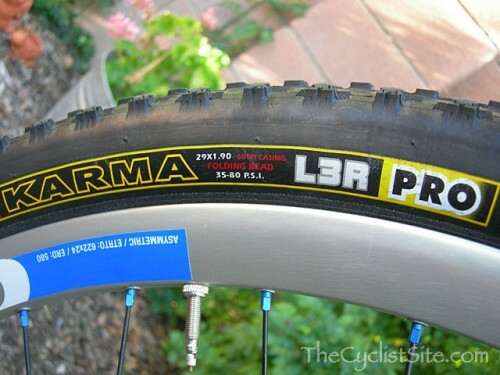 -Bontrager TLR tires: Works with decent reliability on Stan’s rims and I have heard enough about failures with Mavic/UST rims that I will not use TLR tires on those types of rims. -Bontrager TLR Rim Strips/Wheels: Works really well with Specialized’s “2Blis” tires. Geax tires are waaay too tight and will not work at all with the plastic strip installed. A Stan’s strip in a TLR rim will work with a Geax tire, however. Continental tires work well on TLR rim strips. TLR rim strips have also been used by myself in Velocity Blunt rims with Rampage tires with good results. 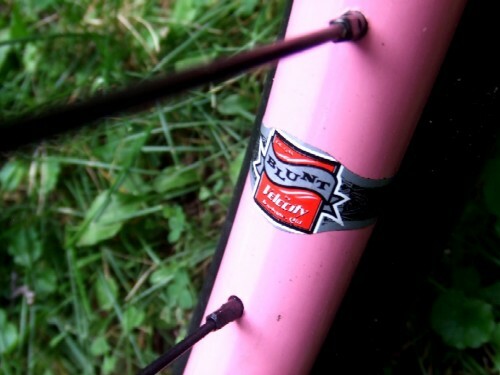 -Stans ZTR Rims and Strips: Works great with Specialized, Bontrager, Continental, and some non-tubeless tires. GEAX tires are just too tight to be field serviceable. I won’t use a Geax tire on a Stan’s rim for that reason. Stan’s strips: I have used these only on ZTR rims with the exception of some DT Swiss TK 7.1 disc rims and that works flawlessly. 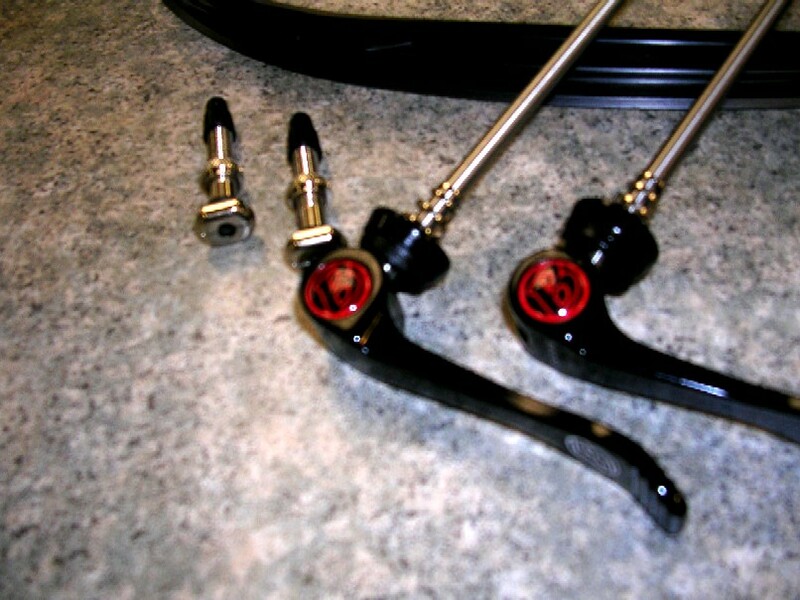 CaffeLatex valve stems for tubeless tires and the injector for their sealant. This is the best sealant and system available on the market. Sealants: I have used Bontrager’s Super Juice which seals a tire casing really well but is very poor at sealing punctures. Slime Tubeless Sealant works very well, staying wet for well beyond six months. Stan’s sealant works well initially, but dries out in a span of three to four months, still keeping the carcass air tight, but the puncture protection falls off dramatically, as you can imagine. Hutchinson Fast Air- Seals up casings really well, but does not stay liquid very long at all and does not provide very good long term puncture protection. Geax Pit Stop works almost exactly as the Hutchinson product. (Note: To be fair, the Hutchinson and Geax products are for inflation/quick repairs. Both companies have a product that claims long term puncture protection.) CaffeLatex: This has been the best available solution I have used so far. It is easily introduced through valve stems and seals punctures very well. It claims the sealant foams up while riding to provide better sidewall protection. While I can not vouch for that yet, it does foam out of my valve stem when I open it. In my still ongoing tests, the CaffeLatex product remains wet going on month five now. 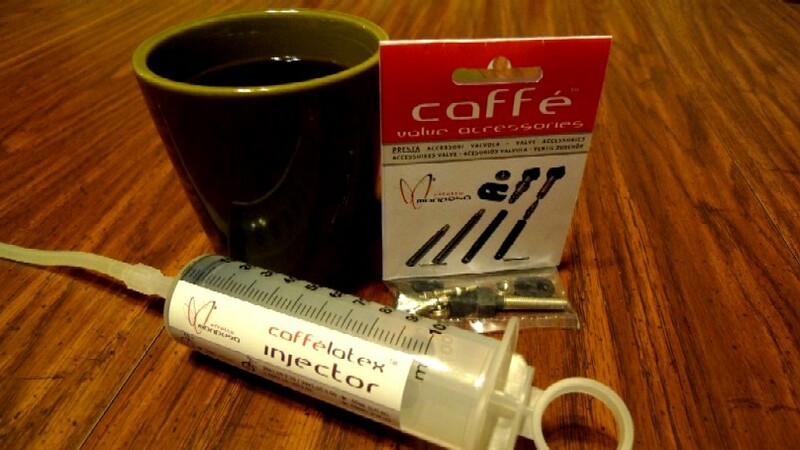 Homebrew- I have a home brew that I will not divulge here, but has outperformed everything else on the market I have tried so far with the possible exception of this new CaffeLatex solution. Next time I will get into the day to day care and feeding of your tubeless tire set ups. Stay tuned! The Race King tires are still being ridden here and I now have a Midterm Report ready for you all on these new shoes from Continental. First off, a big change was made since the last report in that I have set these up as tubeless tires on Stan’s Flow rims using the CaffeLatex sealant I have been testing. The process was easy and so far the Race Kings have had no issues being run tubeless, much like the experience I had with the Mountain Kings last year. Because of this change, the width measurement has gone up from the 51.3mm I got in my last report to a whopping 56.5mm! (That is 2.22 inches, so it made the claimed width) Continental’s 29″er tires seem to stretch quite a bit, and even more so as tubeless tires. This is interesting and not necessarily unique to Continental; however, their casings seem to stretch more than others I have converted or tried tubeless. With that in mind, the Race Kings continue to be an eye opener in terms of traction. Climbing, braking, and cornering traction are all above expectations with this tire. Especially considering what we have for knobs here. That said, there are a couple of downsides I want to point out with the Race King tires. First, the lack of anything substantial for side knobs means that lateral traction is not good. If these tires let go, you won’t save it in a corner. Ruts, off camber, or loose rocks and wet roots reveal this weakness as well. Secondly, any “extreme” situation will quickly overwhelm the Race King. Loose rocks, steep pitches, mud, or loose over hardpack will make you wish for more aggressive tread. (But that is what the Mountain King is for) Still, you won’t be disappointed if you use these as an “all rounder” tire, or specifically as a racing tire. The performance on dry, rough to buff single track is awesome. 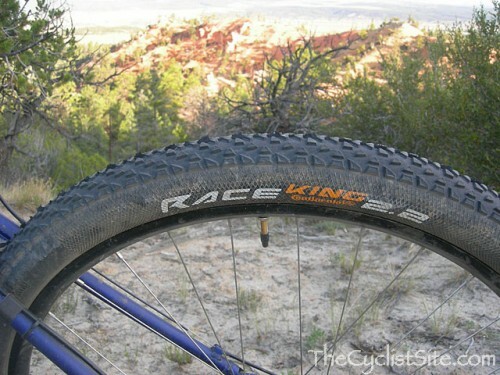 The Race King also impresses as a tire that is cushy. 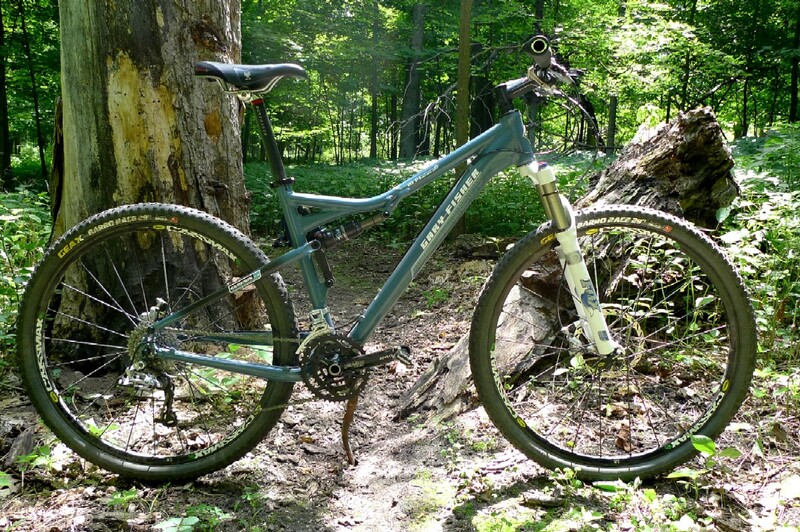 The casing seems to be a very supple one and rides similarly to a Schwalbe Racing Ralph in that you seem to be excused from dealing with small trail chatter and the odd branch or small stone with the Race King. I believe it has a lot to do with how fast these tires roll as well. Between the plush casing and low rolling resistance, the Race King might just be the best single speed, rigid fork tire for racing that there is for 29″er freaks. Obviously, it makes your suspension rig feel that much better as well. The comparison to a Bontrager XDX has come to mind for me here. The two tires are very similar in profile, width, and in how they perform. The only big difference between the two is that the XDX is stiffer feeling, probably due to the “AR” casing that Bontrager uses to beef up the XDX tire with. Otherwise the XDX and the Race King are tires with much the same performance characteristics. My choice would be for the Continental in most situations just because I prefer the nicer ride quality. If I lived in more severe terrain though, the XDX would win out due to its burly construction. That’s it for now. I will continue to put the race Kings through their paces and I will chime in with a Final Review in about a month.